Are you new to the solar industry but would like to become a large IPP/Developer in the solar sector? Talk to us. Solar Mango has been acquainted with the solar PV sector right from the time the first batch of the National Solar Mission started, in 2010. We have assisted many companies in fully assessing the commercial feasibility for becoming a medium or large scale IPP in the solar power sector. Our extensive relationships with key stakeholders such as panel and BoS manufacturers, as well as with policy makers and government, ensures that you get the most authentic assistance and advice for the entire duration of the solar power plant implementation. Solar power projects typically have a lifetime of 25 years; it is hence critical that a developer does a rigorous evaluation of all financial aspects of the project. With its in-depth understanding of every small component involved in the solar PV power plant value chain, Solar Mango is one of the most authentic experts available in the country to provide you with financial modeling and evaluation that will stand the toughest scrutiny. With our presence in the Indian solar sector right from its inception six years back, we understand the Indian solar market and regulatory structure exceptionally well, and hence are able to provide clear and critical analysis with region-specific focus, tuned to the developer’s needs. Solar Mango can provide you with a rigorous evaluation of EPC and components for implementing your solar power plant. In the role of project management assistance, we will also assist you in making critical component decisions – especially for critical components such as panels and inverters – so that you get the highest quality components and solutions at the best possible price. – Our expert team will do a thorough analysis of all the commercials required during the entire process of the solar power plant implementation. This will include commercials for the EPC, commercials involved in the PPA signing, and more. We will prepare the complete techno-commercial feasibility analysis and detailed project report that will be needed by the banks and other lending financial institutions. Where your organization is interested in bidding for central or state government solar projects, Solar Mango’s commercial team will assist in the competitive bidding process to ensure that you get the best deal possible. Please note that even a small difference in the bidding price can result in a difference of crores of rupees as the projects are usually of 10 MW and above, running into power purchase agreements for 25 years. 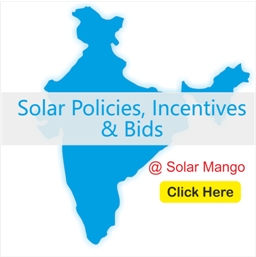 In select cases, Solar Mango assists clients in identifying private off-takers for solar power generated. Please note however that private purchase of large scale solar power is yet to take off in a large manner in India, and hence this avenue is open only in select cases, based on specific regions and for select clients. If your firm is new to the Indian solar sector, it will also require a strong team to become a fully functional IPP or developer. 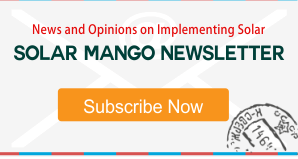 Solar Mango, with its vast industry contacts, as well as through its large renewable energy portals and popular industry newsletter, is ideally positioned to help you put together the best possible team. Solar Mango, through its technical partners, can also provide you with the Owner’s Engineer assistance during the solar power plant implementation. In this role, we provide you complete support in the form of review of daily progress, regular reporting and also auditing of the key components of the project implementation based on international standards and checklists. Background: A client holding a PPA under the Karnataka Land Owning Farmer’s Scheme, required turnkey assistance for solar PV power plant implementation. The client approached Solar Mango for assistance in the entire process of solar power plant development – from financial modeling until the time the power plant starts exporting power to the grid.